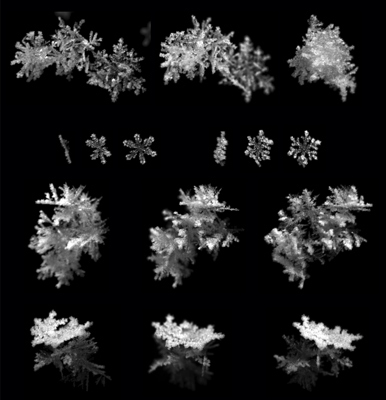 A series of snowflake images have shown a diversity of shapes that can be taken by these crystals. The images were captured by 1.2MP and 5MP cameras with an exposure time of 1/40,000 of a second. Snowflakes interact with frozen water droplets as they fall to the ground producing fluffy bodies mid-flight. The images were captured as part of a project by the University of Utah and National Science Foundation. The goal of the project is to improve weather modeling with accurate data on how snowflakes shapes interact with data and when and where the snowstorms will happen.